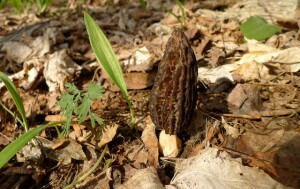 Finding morels,the first gourmet wild mushroom of the season,offers a thrill above all others. As maddeningly elusive as they are delicious,they’ve been a bit of an obsession of mine for the past decade. Despite my enthusiasm and frequent forays in search of them,each spring passed,disappointingly with no morels. That is,until last spring. Scrambling up a steep slope dominated by mature ash trees on a wild leek foray with Karen and Greg, we stumbled onto morels in perfect condition,popping up through the leaf litter and moss. What a thrill to find them in real life,not just in pictures! Those lovely little mushrooms,used deliciously and judiciously, as well as dried for storage,graced many a meal over the past year. So this past weekend,not daring to hope for success again,we ventured out to the same hallowed ground,ostensibly to harvest the abundant wild leeks. And there they were, perfect little morels,just as we found them last year. 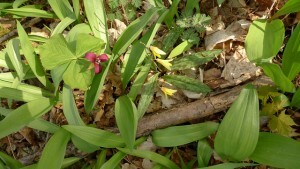 What can you do but give a little whoop and and dance amongst the spring ephemerals? We picked enough to make a savory appetizer for our localvore dinner and divided the rest between our two households —enough for bragging rights but not so much to quench the desire to seek more. Before leaving that blessed place so favored by morels,I took a long,analytic look,hoping to absorb the features. At every subseqent opportunity I’ve searched and found other places that look much the same —rich soils inhabited by wild leeks and trilium,large ash trees with little intrusion from maples,a slope with some erosion and moss —but with no sign of morels. Hunting morels seems to require about 75% luck and 25% knowledge. Mushrooms in general,and morels in particular are peculiar creatures. The primary organism is a network of filaments underground for morels and in wood for oyster mushrooms and others of thier ilk. What we see on the surface as a mushroom, is the ingenious fruiting body,designed to deliver spores into the air. The underground portion can grow for years without fruiting if conditions don’t suit it. 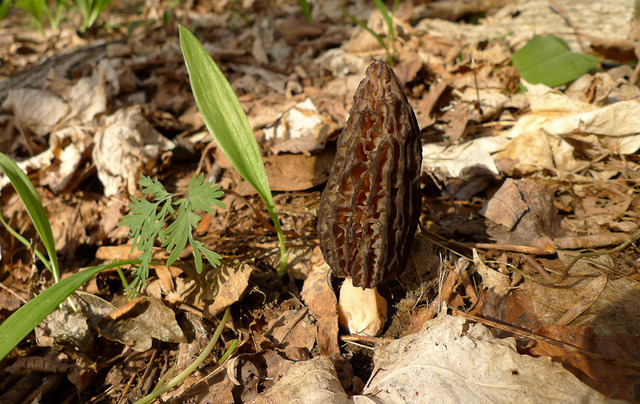 So even with close attention to terrain,vegetation,weather,moisture,soil type and acidity,temperature,and timing it’s tough to predict where morels might happen to live and when they might decide to fruit. But the hunt itself is good healthy fun so why not continue. Maybe I’ll get lucky this year and actually find some yellow morels. They are said fruit later,when the apple trees bloom and the oak leaves are the size of a mouse’s ear. That charming description itself,motivates me want to look for them,despite my utter lack of sucess to date. As with all foraging,be sure to consult a reliable expert or resource book before eating any wild mushroom and always cook them well. A number of websites offer advice and good photos of both the edible morels and the look-alikes you should admire but not eat. We are going on a foray today and hoping to score some morels. Have fresh bread,wine and cheese to cheer us later on some sunlit hillside. My memory ws wrong on the yellow morels Faith. I checked my log and I found them in SoVermont on 5/20/04,5/18/06 and 5/26/07. My camp is powered entirely by LP and solar. It is painless to live without AC. Found two yellow morels yesterday. I did not pick them in hopes more may come back. They were right on time with previous year’s finds and in the same area.